Engineers have reopened a tunnel that goes deep inside the ancient monument of Silbury Hill in Wiltshire. 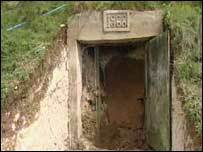 The tunnel, dug in 1968, was the last of many made over the centuries by archaeologists exploring the site. Engineers are planning to stabilise the 5,000-year-old structure, which is believed to be the world's largest man-made prehistoric mound. Archaeologists will also try to unlock the site's ancient secrets and find out how, why and when it was built. Earlier this year, archaeologists found traces of a Roman settlement at the landmark. 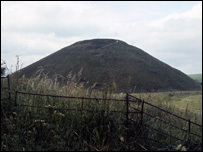 English Heritage, which is conducting the stabilising work, believes there was a Roman community at Silbury Hill about 2,000 years ago. It says the site may have been a sacred place of pilgrimage. "We don't know exactly what it was for but it was probably part of a ceremonial and sacred landscape which centered on the Avebury henge," said an English Heritage spokeswoman. The 130ft Neolithic mound near Avebury - one of Europe's largest prehistoric monuments - is thought to have been created some 3,000 years earlier. Heavy rains in May 2000 caused substantial damage to the hill, with the collapse of an 18th century shaft. Parts of the ancient site are thought to be collapsing because of the tunnels dug by archaeologists over many centuries. After prising open the tunnel's sealed door on Friday, engineers are expected to spend four months, filling the tunnels with hundreds of tonnes of chalk to stabilise the structure. Archaeologists will also be going into the hill, hoping that modern science can solve the mystery of why the hill was built in the first place.